Andy has been a stalwart of performance poetry and spoken word in Christchurch for the better part of two decades now, honing his craft while also writing a series of novels, touring with bands, raising a family, surviving earthquakes and running restaurants. You know, all the easy stuff. He's featured on Catalyst CDs, the touring 'Road Show', is a member of the Lyttelton 'band' of poets and was runner-up in the Christchurch Poetry Slam 2014. 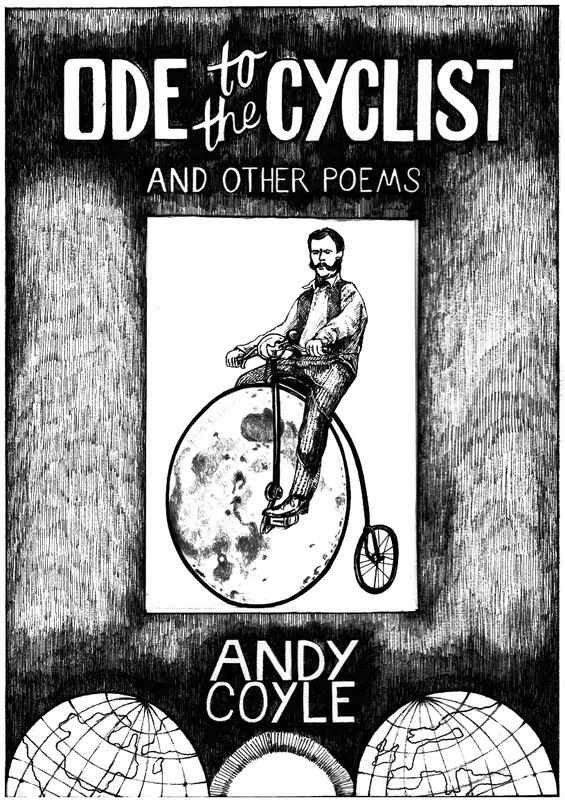 Ode to the Cyclist and other poems is Andy Coyle’s first published volume of poetry. The title poem celebrates the cyclist as a boundary crosser, a trickster, and the collection is full of those colourful characters who occupy the margins, the wandering poet, the lizard skinned junky, the urban shaman, the Christmas loner, the idealistic artist, the madman on the bus, the forgotten seaside destination, the voices on the wind, the long gone goddess, and the ghostly memories of an invisible city. We're going to be holding a launch event for Ode to the Cyclist and other poems at the next Catalyst Open Mic night so if you're in the shaky city, head on down to the Twisted Hop on Ferry Rd, Woolston to get your advance copy, hear the words from the poets mouth and generally celebrate in the good old fashioned way with us. Ode to the Cyclist and other poems is Andy Coyle’s first collection of poetry. It highlights the best of Andy’s poetry over the last ten years, much of which has featured in the Catalyst literary journal. The collection includes regional poetry from Bank’s Peninsula and Christchurch. It includes poems which explore the role of the poet in modern society. And through the image of the cyclist, tempts the reader into considering the role of the boundary crossers, the ones who can interpret the simple information hidden within the daily cycles of life, -sun, earth, moon, personality, -and through those equally simple and complex information sources, and through the simple joys of cycling and observing, to take pleasure in our world. Also included in this selection is the poem Invisible City, Andy’s response to the loss of his city through earthquake. Andy was included in a group of artists who were invited to access the central city red zone (which was guarded by the army and only open to demolition teams) after the earthquake, to document an artistic response. Those responses, along with Andy’s tendency to cycle around the perimeter of the red zone in the bizarre darkness that was created by this red zone, formed the starting point for the poem. Andy Coyle is a writer of poetry, fiction, theatre, songs, and menus. In both 2011 and 2014 he represented Christchurch in the NZ Poetry Slam finals. He is a regular contributor to the Catalyst Open Mic Night, The Catalyst Literary Journal, and the Catalyst Road Show. He has toured poetry around New Zealand and has appeared in a number of literary festivals, street festivals, performance festivals and Jazz festivals. He has had a short story filmed, a play performed, and a poem painted as a mural in the seaside suburb of New Brighton.